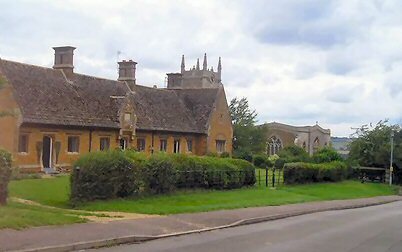 East Carlton is a small agricultural village about seven miles north of Kettering and three miles west of Corby. The population in the 1911 Census is recorded as 87, the same figure as in 1881. In 1921 the population had risen to 92. Photo:John Thorpe The main feature of the village was the seat of the Palmer family, Carlton Hall, with its extensive park. 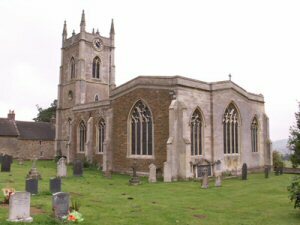 The Parish Church, St.Peter's, was originally built in 1228 as a chapel of ease of the Parish of Cottingham. It became a separate parish in 1230. In 1785 Sir John Palmer and the Rector, the Revd Matthias Slye (rather an appropriate name by all accounts), requested permission to take down the two side aisles and put in new flooring and new pews. These are box pews, with a special one for the Lord of the Manor, and there is a two-decker pulpit. The alterations were completed in 1788, the cost being paid by Sir John Palmer. 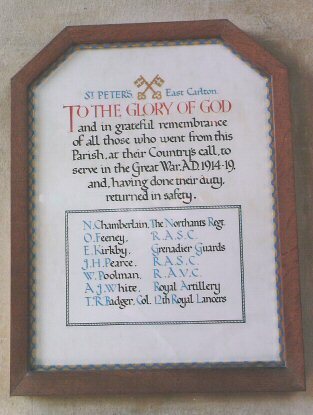 Inside the church, on the west wall to the right of the door, there is a memorial to the seven men from the Parish who served in the Great War "and, having done their duty, returned in safety". In 1919, a meeting took place in East Carlton to decide on a suitable memorial to mark the end of the Great War and also the fact that the seven men from the village who had fought in the war had all returned home safely. It was felt that an appropriate memorial would be to build a village hall. A surplus army hut was bought and converted as the village hall. It was opened on the 20th of January 1921 and was know as "The Hut". In the 1901 Census, nearby Corby had a population of 4,287. It was stable at about this figure for many years, but a large increase began in the late 1920s. The firm of Stewart & Lloyd developed the steel industry, with a huge rolling mill said to be over a mile long. The population of Corby rose rapidly until the 1970s, when it levelled off. The figure in the 2001 Census is 53,177. This affected East Carlton. In 1934 Stewart & Lloyd purchased East Carlton Hall and its surrounding parkland. Round the edge of the park they built 59 houses for their managers and white collar workers. The Hall was occupied by unmarried staff and visiting managers. Much of the park is now open to the public as a Countryside Park with a visitor centre in the old stables. The Hut was used for many village functions over the years, but as the population trebled in size it became too small. In 1936 the village hall was extended to become the Coronation Hall. In 2001 the Coronation Hall was demolished, but the original "Hut" still survives in an East Carlton resident's garden as a museum devoted to memorabilia from both World Wars. We are indebted to Rosalind Willatts and Chris Capps for much of the information used in this account and to Jan Nix, Rosalind Willatts and John Thorpe for providing us with photographs.